I may be way behind the trend in Glasgow when it comes to checking out ‘Babs and their gourmet kebabs but I guess it’s true what they say; good things come to those who wait! This is a place that has been on my to-eat list for as long as I can remember yet for one reason or another, I just hadn’t made the trip. That all changed this weekend and I only have myself to blame for missing out for so long. Simply put, and as ‘Babs themselves say, these are kebabs done right! The funny thing is my reason for going to ‘Babs this weekend is the same reason that has put me off going in the past; the inability to book a table. After my Saturday dinner plans fell through I needed a new dinner venue and somewhere that I hadn’t been before. So with hope in our hearts me and the little lady set off for ‘Babs. I was instantly struck by two things when we arrived: no queue (hallelujah) and the interior was pretty spot on! We were shown to a booth with plenty of space and a good view of what was going on in the restaurant. If I had one criticism of ‘Babs it would be that the beer options weren’t great but we’re here for the food so lets move onwards and upwards. Now as you can see from the picture we didn’t skimp when it came to ordering. It’s a good sign for me when you spend and inordinate amount of time perusing the menu because you simply can’t decide what sounds more delicious. 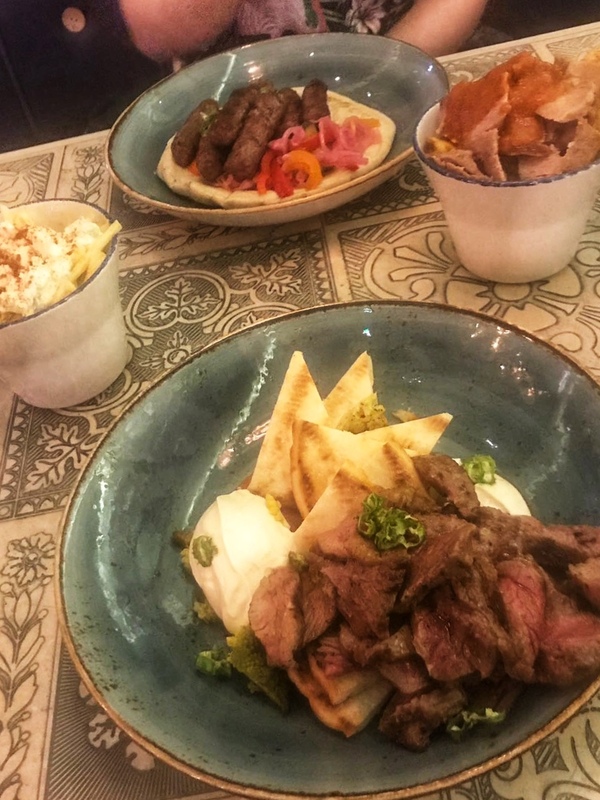 There were quite a few dishes that tempted including the ‘Babs Doner, Lamb Shish and every burger on the menu. If you want to have a look at the menu and see what I mean then you can do so here. I’m getting ahead of myself though, we haven’t even discussed the starters or nibbles as they are on the menu. In my opinion quality wins over quantity ever time. I was more than happy with the choice of olives, house bread or a selection of dips and pittas. 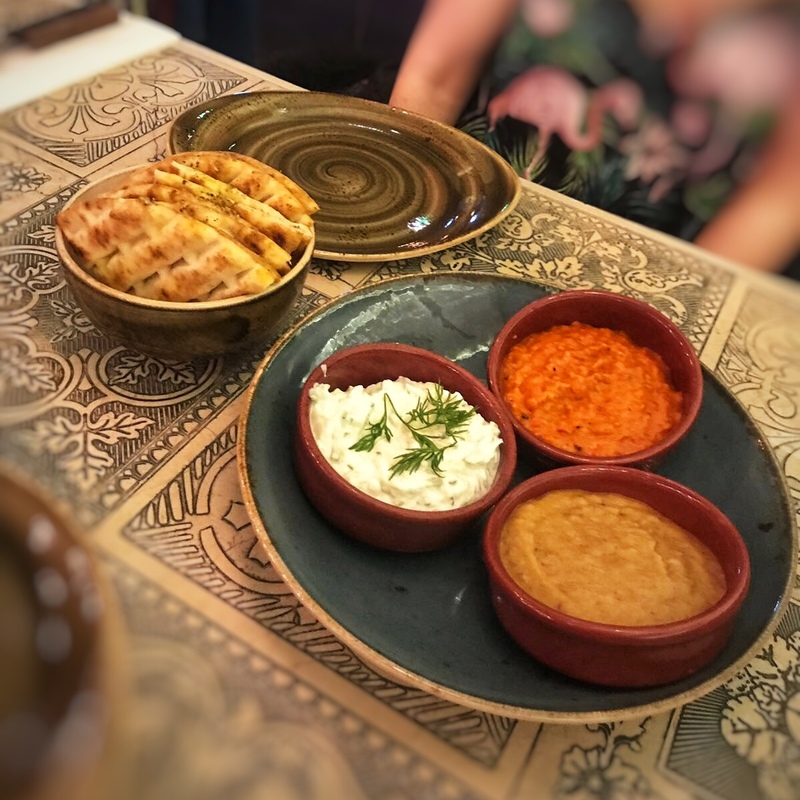 To get the ball rolling we went for the dip platter which allowed you to chose three ‘mini’ dips to be served with pittas. The dips were anything but mini and we actually had some leftover for when the mains arrived to! 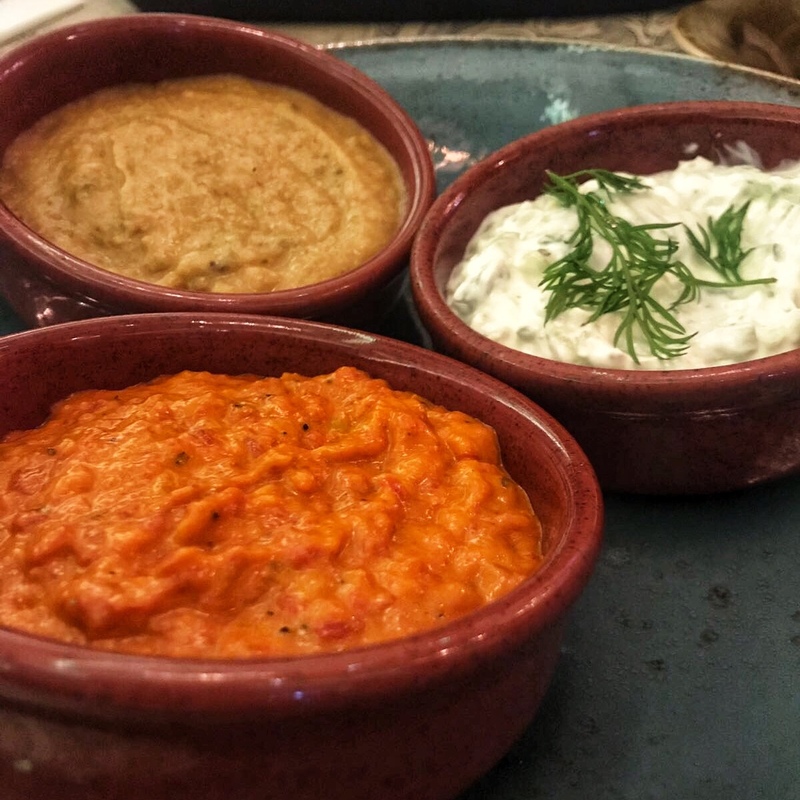 We opted for the Tzatziki, Babganoush and Ajvar dips and were not disappointed. Both the Babaganoush and the Ajvar had a great smoky flavour I enjoyed. I’d defintely recommend trying these if you go. They were complimented nicely by the Tzatziki which was much lighter and acted almost as a palette cleanser. Although it complimented the other dips I’d maybe try the Hummus next time as it wasn’t my favourite of the three. 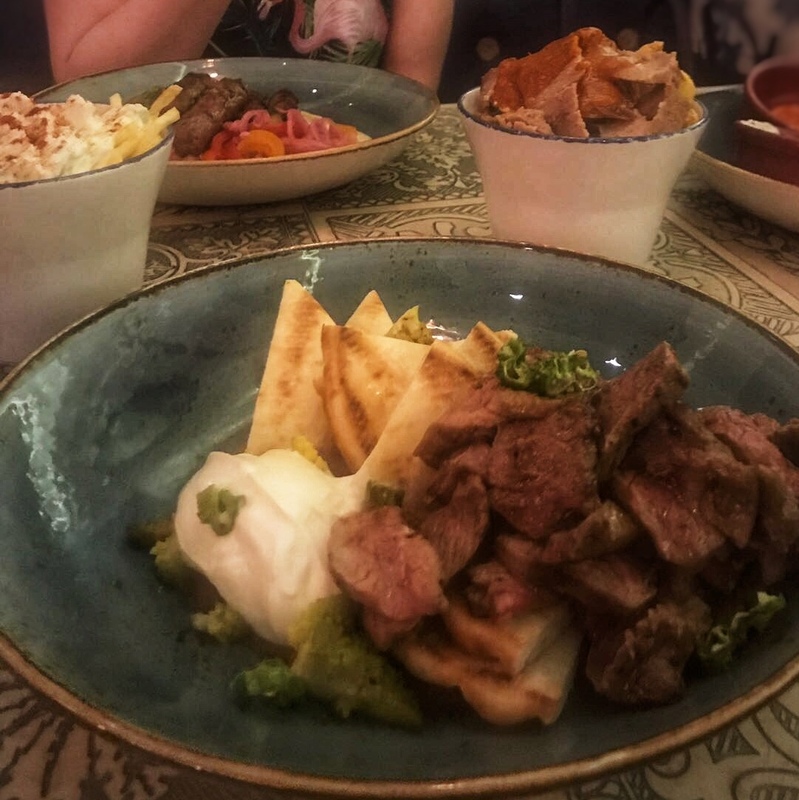 Next up were the mains and we finally decided on the Lamb Iskender and Che ‘Babs from the menu. I had the Lamb Iskender bab which is thinly sliced lamb grilled to your preference. I went for medium and it was cooked perfectly. It’s served on a bed of grilled artisan bread chunks and drizzled with marinara & hot chilli butter. To finish it off it’s served with a dollop of garlicky yogurt and grilled pepper. It was delicious, the lamb was tender and the hot chilli butter and marinara gave the dish a nice little kick. The bread was also great and I enjoyed trying different flavour variations with each chunk. This was as far removed from the usual kebab you might think of when someone mentions them yet all the staples were there. Bread, meat, spicy sauce and veg. I really enjoyed this and would recommend it though I’m sure on my next visit I’ll be trying something new. Now let’s talk about the Che ‘Bab and quite possibly the star of the show on this visit. After the little lady gave me a try I had serious food envy and that’s saying something as I really enjoyed my bab. The Che ‘Bab consists of grassfed beef mini koftas which are marinated and chargrilled in a Balkan style. They’re then served with roast pepper Ajvar dip, house pickles and more of that artisan bread. I’ll admit it may not look the most appetising but the Che ‘Bab was certainly delicious. 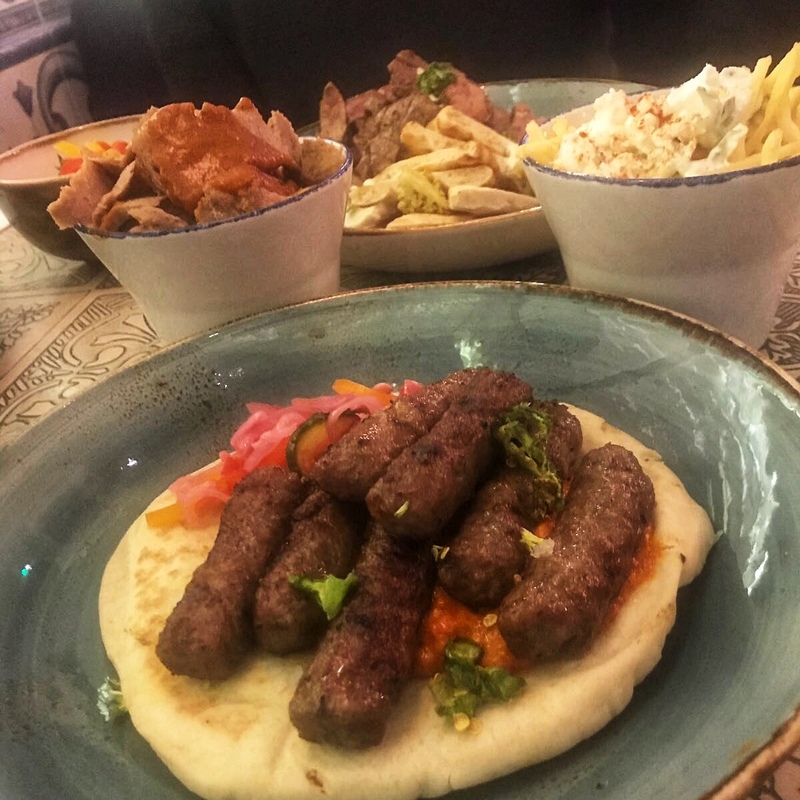 The mini koftas were packed with flavour and although I was underwhelmed with the side of homemade pickles we ordered separately they were excellent on this dish. Again the Ajvar added a great smoky taste and everything together just worked. And then there was the sides … apart from the pickles that I mentioned earlier they were great. 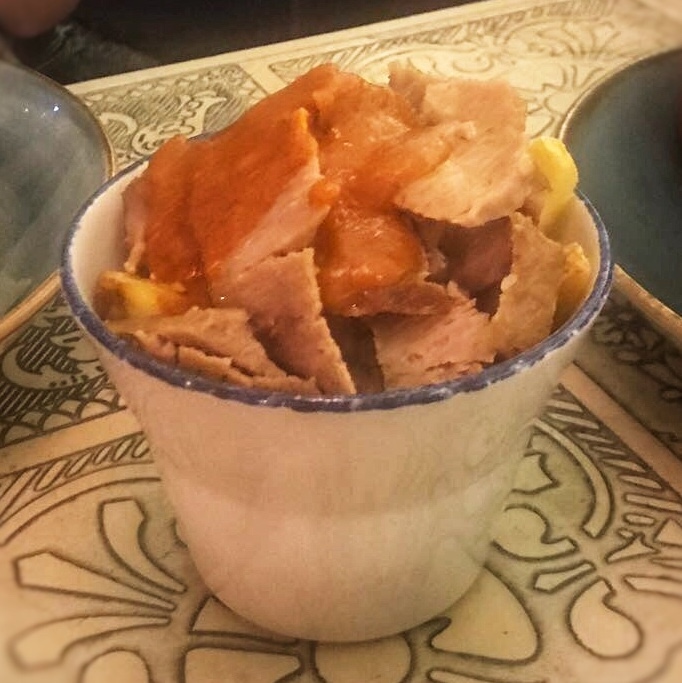 The Doner chips are exactly what they sound like but I doubt you’ve ever had them this good! I had to order these after opting against the Doner Bab for my main and I’m glad I did. The lamb Doner was unsurprisingly better than any I’d had at 3am on any night out and the chips were great. But the sauce, now that was something else! The harissa chilli sauce was amazing and I’d happily buy it by the bottle and smother everythign in it. It really was that good. As well as the Doner chips we also ordered the Greek skinny fries which were a pretty great accompaniment too. They were possibly the skinniest skinny fries I’ve ever seen but they were very tasty and the fact they were dusted with paprika was always going to be a winner. 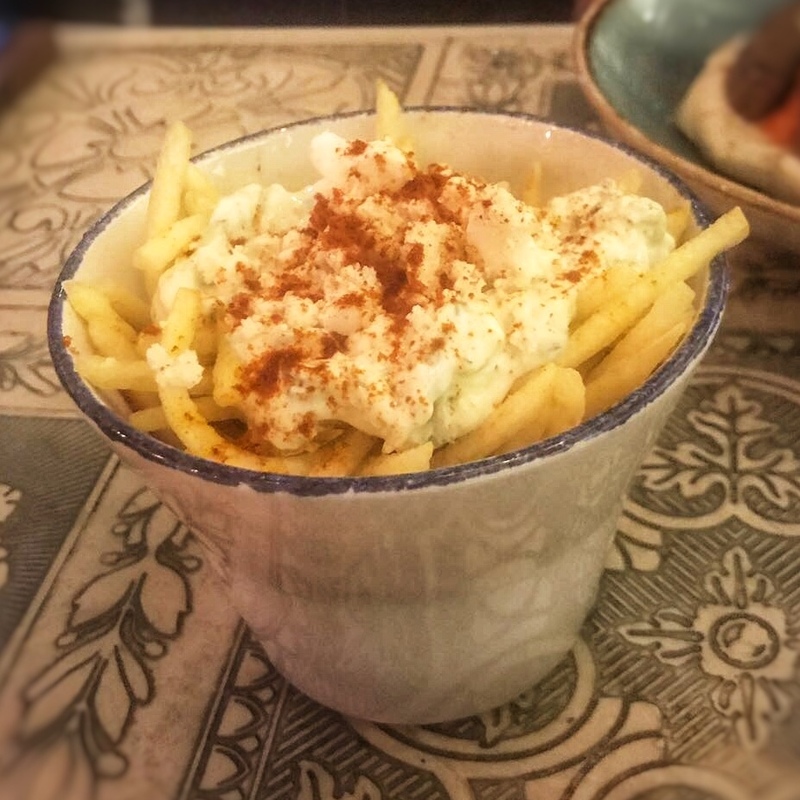 They were also topped with Tzatxziki and feta which gave a new and refreshing slant on the classic chips and cheese genre that I really enjoyed. To finish off this most excellent of last minute dinner trips we ordered the Baklava and had to be practically rolled off the premises! 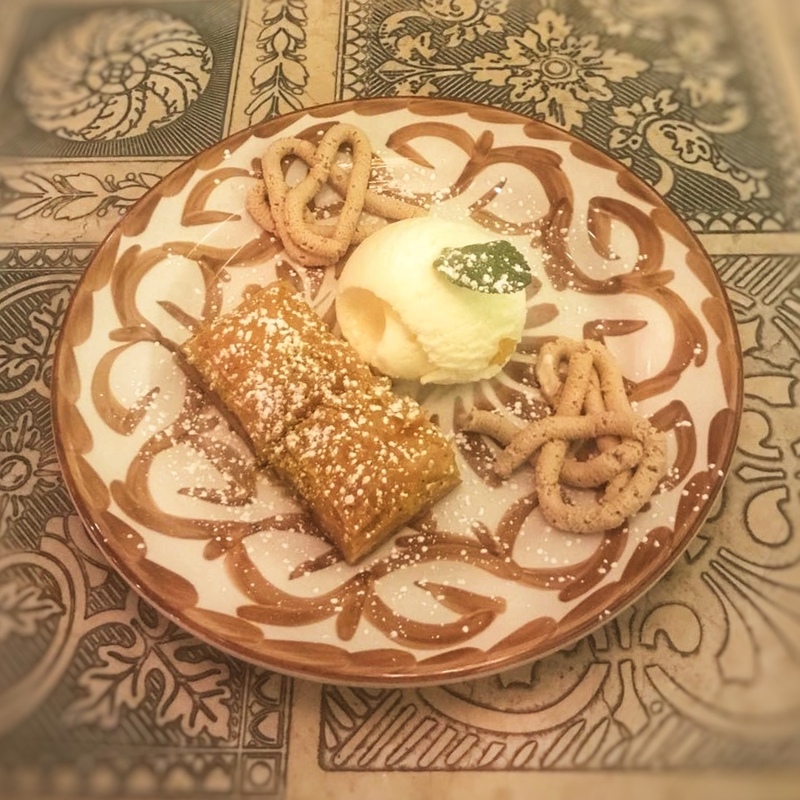 The sticky syrupy homemade pistachio baklavas with a scoop of ice cream and a drizzle of nutty honey sauce were the perfect end to the meal. As someone who’s not a huge dessert fan I seem to be coming around and the sweetness of this dish from the honey was just right! I think it’s fair to say that ‘Babs is a great, if not new, addition to the city centre that’s offering something completely different to most places. 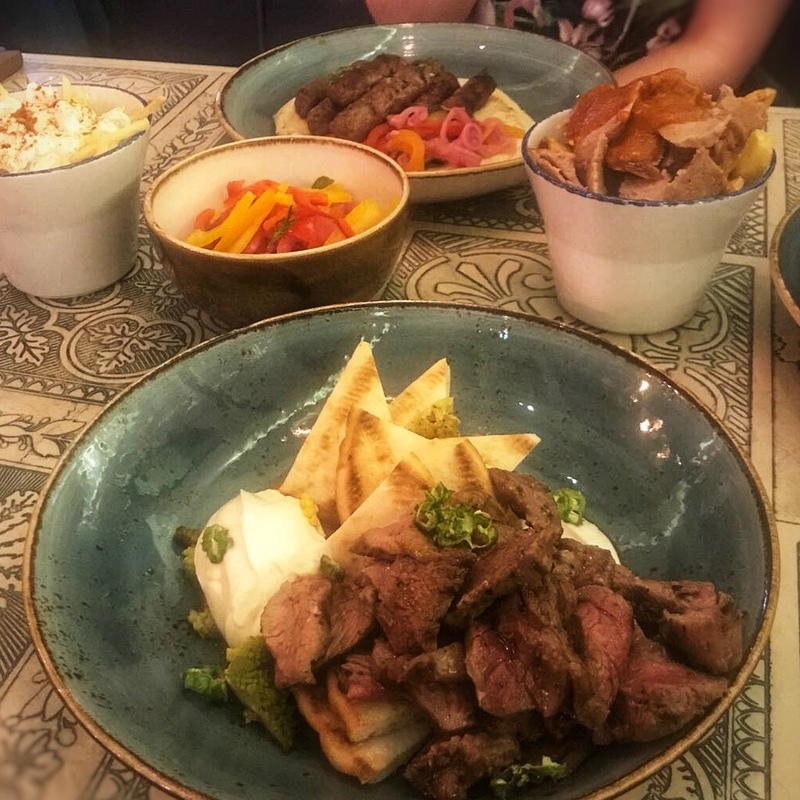 I loved this new gourmet take on the humble bab and can safely say this is the first time I’ve enjoyed one without the inevitable shame that usually follows a late night drunken visit to one of the city centres less fine establishments. It may be the first time I’ve enjoyed one without shame but I seriously doubt it’ll be the last and can see myself back in ‘Babs soon and trying some more of that delicious sounding menu!